Features: ​Three black rings on the center dowel, the bottom ring indicates a 91cm (1 yard) circumference, the centre: 137cm (1.5 yards) and the top 182cm (2 yards). 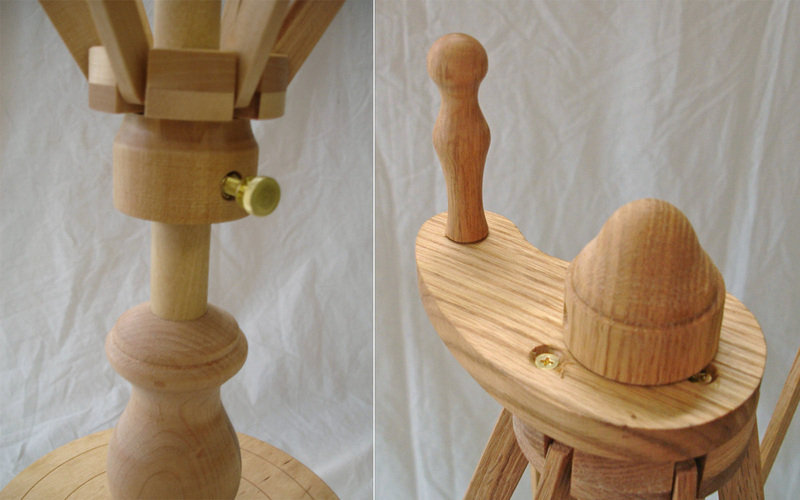 You can then determine the meterage by setting the swift/skeinwinder to the appropriate marked on the center dowel. Count the number of rotations while winding the skein.You can then easily calculate the meterage by multiplying the meterage for one rotation by the number of rotations you made. ​The adjusting ring, shown to the left, locks the setting in place. 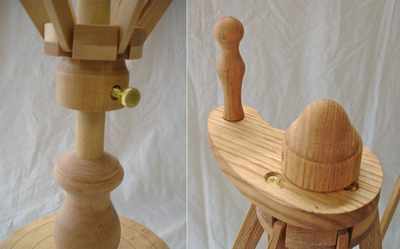 The winding handle, shown to the left, makes it easy to wind onto the skeinwinder. (available in Oak, Cherry, Maple, Walnut). 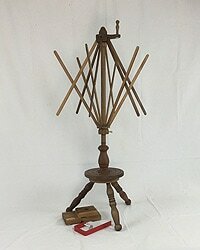 The umbrella section, as shown at the bottom left, folds just like a regular rain umbrella, so your swift/skeinwinder takes up less room. 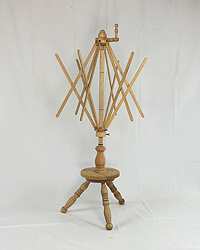 This beautiful and functional piece of furniture has been delighting fiber artists since 1990. It measures 42" tall, from floor to top of knob. 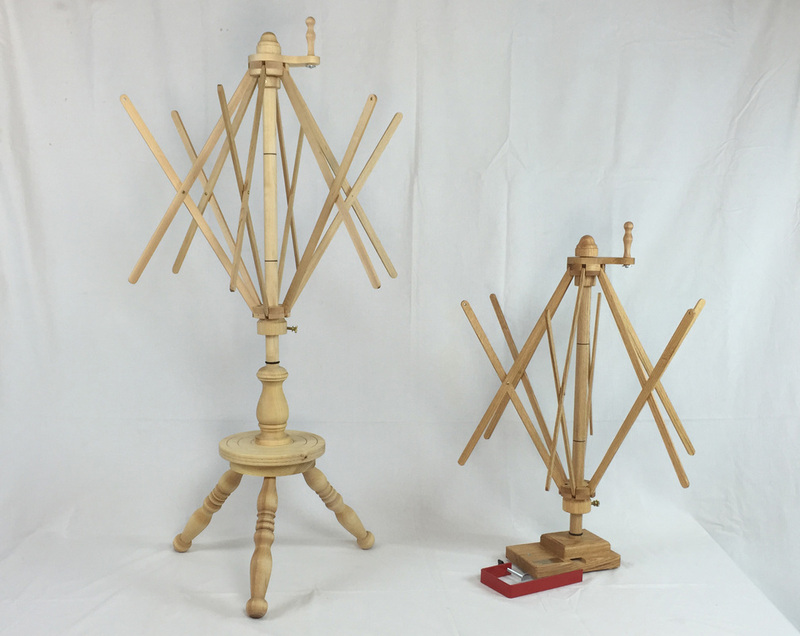 In April 2007, with the introduction of our table model, we upgraded our Floor Swift / Skeinwinder. This allowed the Floor Model to be collapsible, portable and interchangeable with the new Table Base. All Floor Swift / Skeinwinders built after March 2007 incorporate all the new improvements. Units made prior to April 2007 can be upgraded. See: "Upgrading older floor models"
Introduced in April 2007, this addition to the Strauch Fiber Equipment line uses the same umbrella section as is used on the floor model. Simply screw it into the table base, attach the table clamp and you're ready to work. 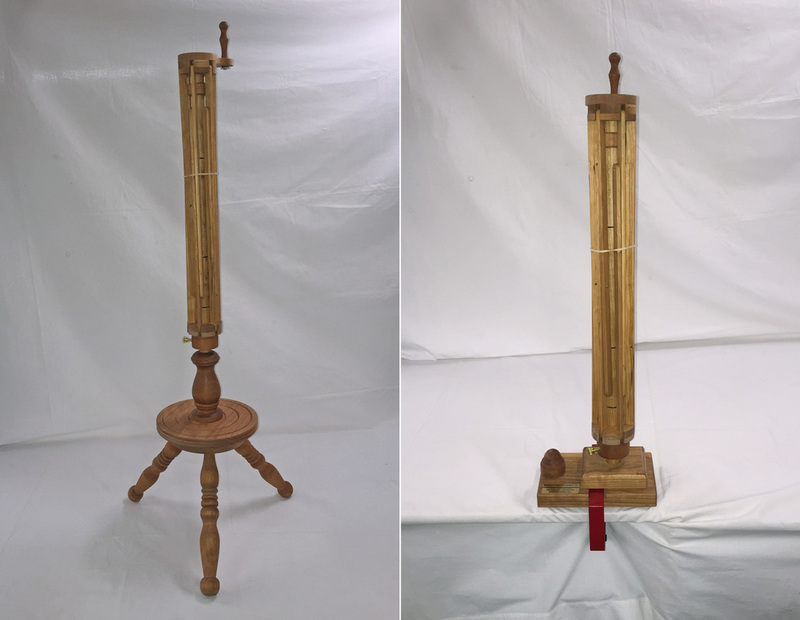 The table model measures 27" tall from table surface to top of knob. 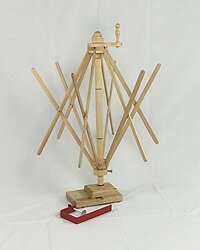 A suggestion: to more easily use as a skeinwinder, mount it on a shorter table so the top crank is more accessible. ​We offer special pricing to our customers who purchase the Floor Swift/Skeinwinder and the Table base at the same time as a three-piece combination.